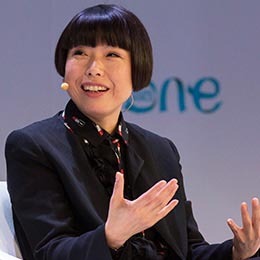 Angelica is the globally-lauded founding editor-in-chief of Vogue China, described by Forbes magazine as “the high priestess of China’s fashion scene”. Her insight into the Chinese luxury sector, and Vogue China’s phenomenal success story, is highly sought after. As well as the main Vogue China title, which reaches the nation’s most affluent fashionistas, Angelica launched Vogue Me, which targets the millennial generation and Vogue Film, which features the movie industry A-list. Under her stewardship, Vogue China has increased its readership to 2 million, with its mobile products reaching another 1.3 million daily users and more than 12 million social media followers. At Vogue China she has championed Chinese models and designers, as well as featuring covers with internationally-renowned supermodels such as Kate Moss, Gigi Hadid and Kendall Jenner. Angelica is an eloquent, engaging and dynamic public speaker who has a unique perspective on the China luxury industry and the broader issues of establishing – and maintaining – a brand presence in the world’s fastest-growing economy. Julie is one of London’s elite yoga and nutrition teachers, a popular brand ambassador, TV personality, bestselling author and in-demand royal commentator. Named one of the Top 10 Holistic Health Icons in the world, Julie’s popularity sees her Sunday yoga classes “so packed she often teaches standing on a radiator” – Cosmopolitan. Julie’s time on the transatlantic hit TV show Ladies of London has given her an international profile utilised in brand ambassadorships for the likes of global brands Liz Earle, Nivea and California Walnuts. Julie regularly appears in the media discussing the benefits of yoga and healthy living and has 3 bestselling cookbooks to her name. In recent months, as another American married in to British aristocracy, Julie – official title, The Viscountess Hinchingbrooke – has become a prominent commentator on all things surrounding the royal wedding and was enlisted by the BBC as a commentator for the main event, live from Windsor. Sassi is a multi-award-winning international designer who has been making beautiful gowns and thriving at the hotbed of London’s bridal industry for over 35 years. Sassi is perhaps best known as the designer chosen to create Autumn Kelly’s dress for her wedding to Peter Phillips, the Queen’s oldest grandson. Few designers will get the opportunity to design a gown for a Royal Wedding and experience the pressure and attention that comes with it. This year, Sassi’s expertise was called upon as the Royal Wedding loomed and media outlets raced to secure first-hand accounts from the lucky few who had experience with such a momentous occasion. Sassi’s style is iconic and recognisable, her wedding dresses are renowned for featuring exquisite lines and luxurious fabrics and in style are classic and English with a modern edge. Kruger Cowne Ltd will only collect basic personal data about you which does not include any special types of information. This does however include name, address, email. We need to know your basic personal data in order to provide you with on-going organisational updates and news and/or invitations to our events. We will not collect any personal data from you we do not need in order to provide and oversee this service to you. No 3rd parties have access to your personal data unless the law allows them to do so. We have a Data Protection regime in place to oversee the effective and secure processing of your personal data. Your information we use for marketing purposes will be kept with us until you notify us that you no longer wish to receive this information. This information is not shared with third parties and you can unsubscribe at any time via phone or email.